Feed Five Children For a Whole Month for only $3.50! “Cookies for Kids” is a campaign designed for people of all ages to raise money to feed hungry children in Bangladesh! Many of these children go to school without having breakfast and don’t even know if they will have a meal when they get home. For only $3.50, nutritious high-energy biscuits are provided to five children, twice a day for a whole month. Each cookie contains the essential nutrients that fuels the body and mind, that will give kids the energy to play, learn and grow! Any event can be done to raise funds to feed hungry children – each dollar raised will have a significant impact! What creative ideas can you come up with? 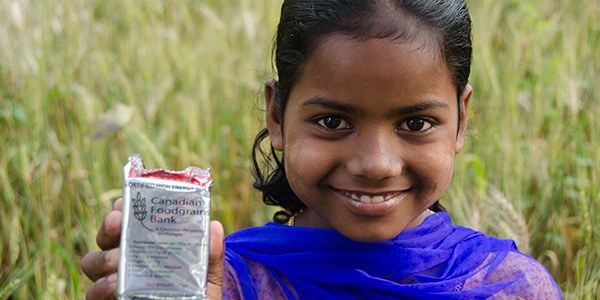 *With a special grant from the Canadian Government through the Canadian Foodgrains Bank, every $1 will be matched 4:1 – that means, your gift of $3.50 will feed five children for one whole month! **You can request your printed package of resources by e-mailing info@erdo.ca. Fight Malnutrition. Increase Learning. Promote Nutrition. 1. Click the "Donate Now" button. If you have created an ERDO log-in, please log into our website first so that you won't have to re-type your name and address information.